The term “ORAC” (standing for “Oxygen Radical Absorption Capacity”) describes a test developed by Brunswick Labs as an analytical tool for estimating the antioxidant capacity of substances. The measurement of ORAC value involves an in vitro test of the capacity of a substance to trap peroxyl radicals. Brunswick Labs remains a leader in the development of ORAC tests. The development of the ORAC test was an important advancement in commercially available analysis of the capacity of various foods and ingredients to trap the peroxyl radical. It has become a de facto standard in the natural products industry. 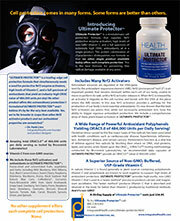 However, the original ORAC method was considered to be just a starting point for comprehensive antioxidant analysis. The arrival of more comprehensive ORAC tests like Brunswick Labs’ ORAC5.0™ test (also known as ORAC-FN) measuring the antioxidant capacities of five different types of oxidants allows more accurately determination of the total antioxidant quenching power of substances. This helps to better assess the effectiveness of existing antioxidant formulas, and supports development of improved formulas that provide a broad range of antioxidant foods and nutrients that combat all major types of free radicals. The fact is that there are a variety of “free radicals” that operate in humans — the most important of which are the primary radicals peroxyl, hydroxy peroxynitrite, superoxide anion, and singlet oxygen. Brunswick Labs has reported that even though the peroxyl radical is the major free radical in the body, it represents no more than 27% of the total antioxidant potential of selected fruits and vegetables. In addition, the original ORAC method favors certain antioxidant substances over others (e.g., anthocyanins over carotenoids) due to the use of a single free radical source (i.e., the peroxyl radical). Various free radicals are formed, behave, and are defended against differently. They all contribute to 1) a general condition called “oxidative stress,” or cellular damage and 2) broad human health concerns caused, for example, by inflammation, DNA and protein damage. They are each implicated in different health problems — from cardiovascular disease to macular degeneration and Alzheimer’s disease and to skin damage and aging. We provide a brief summary of these free radicals (below). Superoxide Anion is a precursor of all other reactive oxygen species and sometimes is referred to as “the mother of free radicals.” It is highly toxic and contributes to lipid and DNA damage. Antioxidants that scavenge superoxide anion also help prevent the formation of radicals such as hydrogen peroxide and hydroxyl. Superoxide anion has been linked to hypertension and cardiovascular damage. Singlet Oxygen is generated in the skin by by UV. In vivo, it is linked to the oxidation of LDL cholesterol and cardiovascular disease. Singlet oxygen is highly unstable and durable. Carotenoids are very effective at scavenging singlet oxygen. The importance of an ORAC test that measures the effectiveness of antioxidant foods, phytochemicals (e.g., polyphenols), vitamins, and other food-based substances against a broader range of free radicals (i.e., beyond the peroxyl radical) becomes apparent when considering how these antioxidants operate in the body. The body faces a diverse group of oxidants, so any test that can provide an estimate of how well a given set of antioxidants will protect cells in reality will also provide a distinct advantage for designing superior antioxidant formulas. Brunswick Labs recently introduced a new, more comprehensive form of ORAC test called ORAC5.0™ (also known as ORAC-FN). This test expands the ORAC platform to measure the antioxidant capacity against each of the five primary reactive oxygen species mentioned above. ORAC5.0™ substantially improves broad-spectrum antioxidant analysis and gives evidence of the diverse antioxidant potential of natural products against radicals other than just the peroxyl radical. Brunswick Labs’ research shows that the antioxidants found in a wide range of natural products are effective against these primary radicals, and that in many cases a preponderance of a product’s antioxidant capacity is described by performance against the four new radicals added to the new ORAC5.0™ panel (which is now the king of ORAC tests). Table 1.0 (below) shows ORAC5.0™ test results for a range of natural substances known to have significant health benefits and that are broadly used in nutritional supplements. 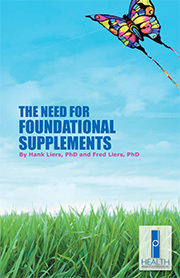 In general, these substances are included at mg levels in supplement formulas. For example, maximum per serving amounts are about 20 mg for astaxanthin, 400 mg for bilberry 25%, 100 mg for grape seed/fruit, 200 mg for green tea extract, 200 mg for coffee berry extract, 100 mg for pine bark, and 100 mg for resveratrol. Considering this the number of total ORAC5.0™ units consumed per serving would typically be in the range of 1,000 to 30,000. Also, it is important to observe that with the exception of green tea extracts none of these ingredients gives excellent protection from the peroxynitrite radical and even green tea extract at the level of 200 mg daily only gives a peroxynitrite radical ORAC value of 400 units. In the table, we have also included the results for HPDI’s new ULTIMATE PROTECTOR™ cell protection formula. It can be seen that ULTIMATE PROTECTOR™ has a total ORAC5.0™ value that is more than 50% greater than green tea extract and many times greater than most of the other ingredients. Table 2.0 shows the total ORAC5.0™ units per daily serving. Because the daily recommended serving for ULTIMATE PROTECTOR™ is 2.8 grams (six small capsules), the total daily ORAC5.0™ measures 486,000 units! This value is over 10 times greater than you receive from typical serving sizes of the ingredients shown in the table!! In addition, ULTIMATE PROTECTOR™ provides excellent protection against all five of the free radical types in the body — something none of the specific ingredients do well!! 299,000 Superoxide Anion is a precursor of all other reactive oxygen species – sometimes referred to as “the mother of free radicals.” It is highly toxic and contributes to lipid and DNA damage.